Can this be a solution to stray dogs & environmental degradation problems in the country? Hyderabad is the first city to get a pet park with its own dog pool, play area and even an amphitheatre. Along with proposing a solution to the issues of land degradation and plastic waste accumulation, the park can also be a solution to problem of stray dogs in the country. 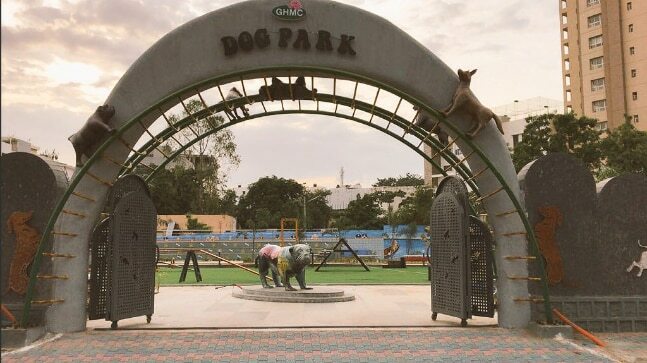 It is time to let the dogs out as the people of Hyderabad get their own dog park. The park has been equipped with dog training equipments, play equipments, off leash areas for exercise, splash pool, sprinkler fountain, amphitheatre, two lawns, separate enclosures for big and small dogs and even a clinic. The park, which has been developed to match international standards for pets and is certified by the Kennel Club of India. The park is not just a haven for dog lovers, but also a glimmer of hope for environmentalists fighting for a country free of land degradation and plastic. The land on which the park is made, was earlier a dump yard that was left barren for many years. The waste land has been converted into a park at a cost of INR 10 million. This gives an idea for other barren lands in the country, with a huge problem of insufficient land and large population, to use more such degraded lands for the welfare of animals. The 4,000 sq ft pavement outside the park has been made out of 1,500 recycled plastic tiles, which is installed by GHM and Hyderabad-based startup – Bamboo House India. These tiles are an eco-friendly alternative that offer a practical solution to the growing menace of plastic. Along with solving the issues of land degradation and plastic waste accumulation in India, the park also proposes a solution to the problem of stray dogs in the country. An estimated 35 million stray dogs live in India and according to World Health Organisation (WHO) India faces about 18,000 to 20,000 cases of rabies every year. The number has been on a constant rise due to sluggish sterilisation drive in the country. If more such dog parks are built in every city, the stray dog population, if not entry into the park, can get better access to sterilisation by the vets in the park. Moreover, dog parks promote safety because the pet owners do not have to walk with their dogs on busy streets. Public dog parks allow dogs to get ample off-leash exercises. While dog parks are a common sight in other countries like France and Switzerland, they are yet to catch up in India, where currently there is no such facility and pets are usually not allowed entry inside regular parks. However soon, a similar facility will be set up in Mumbai too. A dedicated park for pets is expected to come up in south Mumbai’s Cuffe Parade, which will be maintained by the Bombay Municipal Corporation.